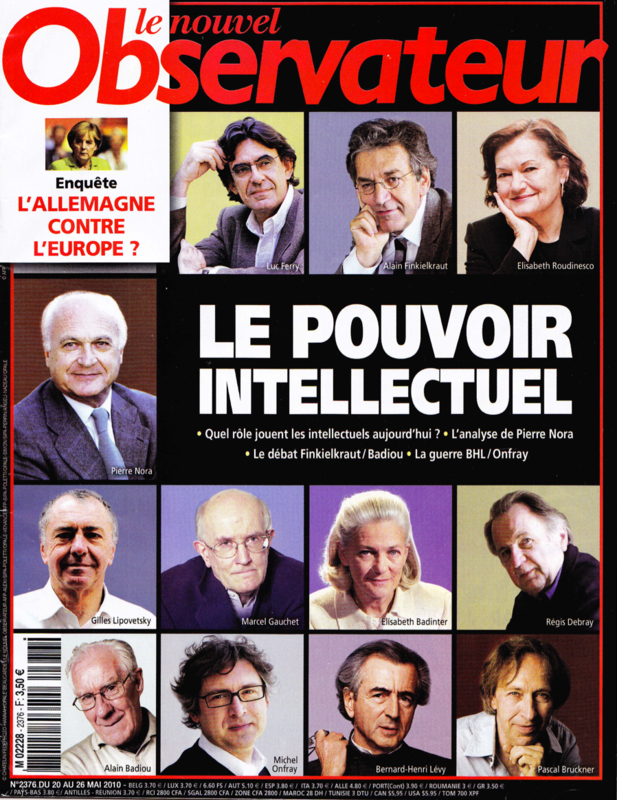 What is the role of the intellectual in France in 2010? And has that role declined in the past several decades? Have the media and the internet profoundly eroded or devalued the voice of the intellectual in public space? The Nouvel Observateur takes up these questions in a recent issue devoted to “Le pouvoir intellectuel” (link). But — here is the complexity — Julliard refutes this idea. The tradition of the public intellectual is not attenuated or corrupted in France; rather, the current generation of intellectuals are in fact engaged and involved. It is nostalgia for a golden age — the age of Liberation, Communism, and Existentialism — that foreshortens the reputation of the intellectual today. But the golden age is a myth. In continuing the theme, Nouvel Obs returns to the debate of 1980 by talking again with several of the young intellectuals it consulted in that year. Pascal Bruckner, Luc Ferry, and Gilles Lipovetsky offer their perspectives on the role of ideas and intellectuals in French society from the vantage point of 2010 (link). And there is a challenging interview-discussion with Alain Badiou and Alain Finkielkraut on communism (link). So Nouvel Obs is doing its part — it is helping to bring to the fore debates and thinkers who can help France navigate into the twenty-first century. There is one form of practical proof of the importance of intellectuals in contemporary France that is not so visible from the United States: the depth and pervasiveness of the presence of deeply thoughtful scholars and writers on French radio and television. For a taste of the breadth and depth of the voices of intellectuals in French society today, consult the list of podcasts made available from radio programming at France Culture (link). Particularly rich are Les nouveaux chemins de la connaissance (link) and Repliques (link). These programs exemplify serious voices, serious debates, and nuanced and extensive discussions. In the United States it seems that the whole issue of the public intellectual plays out differently than in France. To begin — the great majority of the “public” have virtually no interest in or respect for academic discussions of issues. Fox News, talk radio, and blistering political blogs fill that space. Second, however, there is a subset of the American public that does have an appetite for more detailed and nuanced treatment of the issues that face us. Slate.com has between 5 and 8 million unique readers a month; the Huffington Post logged about 10 million visitors in December, 2009; and NationalReview.com logs about 4.5 million readers a month. The Facebook page for “Give me some serious discussion and debate about crucial issues!” could be huge. Looking at the question from another angle — the academic world in the United States is itself a meaningful segment of the workforce. There are about 1.5 million post-secondary teachers (professors and lecturers) in the United States, and the majority of these have doctoral degrees. Of these, a smaller number fall into traditional “intellectual” disciplines: English literature (74,800), Foreign literature (32,100), History (26,000), Philosophy and Religion (25,100), and Sociology (20,300), for a total of 178,300. In engineering, mathematics, and the sciences there are another 262,600 post-secondary teachers. (These data come from a Bureau of Labor Statistics snapshot for 2008 (link).) So a small but meaningful proportion of the US population have advanced degrees and intellectual credentials. They are a core segment of the audience for public intellectuals. And, of course, you don’t have to be an academic to be an intellectual. Further, there are a host of specialists and experts on specific crises — environment, finance, globalization, war — who are called upon to comment on specific issues, and there are specialized “think tanks” that promote and disseminate research on critical public issues. Moreover, voices like that of Bill Moyers have offered critical and nuanced perspectives on public television (link) (regrettably, now off the air). And the United States has a number of prominent academics who speak to a broad public — Henry Louis Gates, Jeffrey Sachs, Martha Nussbaum, Cornel West, Michael Walzer, and James Gustave Speth, to name a few. So there is a domain of intellectual discourse that succeeds in escaping the confines of the academic world and the limiting echo-chamber of cable television; this domain helps to create and feed an intellectual public. Overall, it seems fair to say that public intellectuals have little influence on public opinion and public policy in the US today. Perhaps Richard Hofstadter’s Anti-Intellectualism in American Life (1963) still has a lot of validity. But maybe, just maybe, it is also possible that the Internet is beginning to offer a bigger footprint for serious analysis and criticism for the American public and American policy makers. Perhaps there is a broadening opportunity for intellectuals to help define the future for the United States and its role in the world. And perhaps we can be more like France in this important dimension.